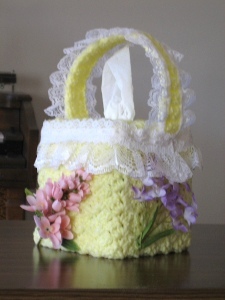 Looking for free, easy crochet patterns to spruce up your home decor? 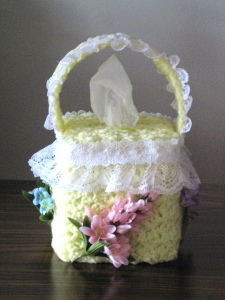 Make a lacy flower basket tissue box cover to make your bathroom or bedroom look flowery and pretty! Rnd 2 – Sl st in first ch 2 sp, ch 3 (dc, ch 2, sc) in same sp, Sm Sh in each ch 2 sp around, join to top of beg ch 3 and turn. Rep Rnd 2 for a total of 10 rounds, fasten off leaving yarn for joining to top. Row 2 – Sm Sh in each ch 2 sp across ending sc in last dc, ch 2 and turn. Row 3 – Rep Row 2. Row 4 – Sm Sh in each of next 2 ch 2 sps, ch 2, sl st in next ch 2 sp, ch 2 (this starts tissue opening), cont. Sm Sh across ending sc in last dc, ch 2 and turn. Row 5 – Sm Sh in each of next 2 ch 2 sps, ch 6 (for tissue opening), cont. Sm Sh across ending sc in last dc, ch 2 and turn. Row 6 – Sm Sh in each of next 2 ch 2 sps, skip 2 ch, Sm Sh in next ch, skip 3 ch, cont. Sm Sh across ending sc in last dc, ch 2 and turn. Row 7 – Rep Row 2. Rnd 8 – Rep Row 2 ending dc in last dc and fasten off. Rows 2-38 – Sc in each sc across, ch 1 and turn. Row 39 – Sc in each sc across and fasten off. Sew lace along each long edge of handle. Sew ribbon lace around top edge. Sew 1 flower to each side.